A thin layer of conducting thermoplastic, applied to common paper with an inexpensive 3D printer or even painted by hand, serves as a low-cost, reversible actuator. When an electrical current is applied, the thermoplastic heats and expands, causing the paper to bend or fold; when the current is removed, the paper returns to a pre-determined shape. "We are reinventing this really old material," said Lining Yao, assistant professor in the HCII and director of the Morphing Matter Lab, who developed the method with her team. "Actuation truly turns paper into another medium, one that has both artistic and practical uses." Post-doctoral researcher Guanyun Wang, former research intern Tingyu Cheng and other members of Yao's Morphing Matter Lab have designed basic types of actuators, including some based on origami and kirigami forms. These enable the creation of structures that can turn themselves into balls or cylinders. Or, they can be used to construct more elaborate objects, such as a lamp shade that changes its shape and the amount of light it emits, or an artificial mimosa plant with leaf petals that sequentially open when one is touched. In June, more than 50 students in a workshop at Zhejiang University in Hangzhou, China, used the paper actuation technology to create elaborate pop-up books, including interpretations of famous artworks, such as Van Gogh's Starry Night and Sunflowers. 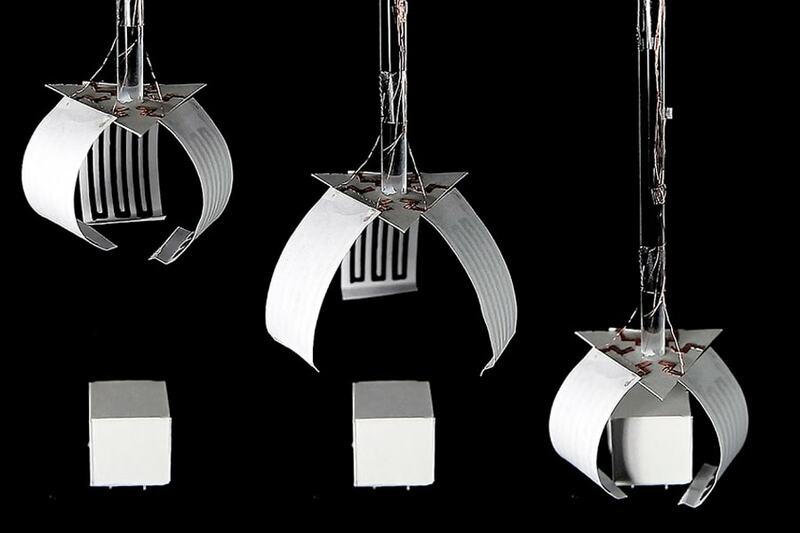 The printed paper actuator will be exhibited Sept. 6-10 at the Ars Electronica Festival in Linz, Austria; Sept. 13-30 at Bozar Centre for the Fine Arts in Brussels, Belgium; and from October through March at Hyundai Motorstudio in Beijing, China. Yao's group presented the technology in April at CHI 2018, the Conference on Human Factors in Computing Systems, in Montreal. "Most robots — even those that are made of paper — require an external motor," said Wang, a CMU Manufacturing Futures Initiative fellow. "Ours do not, which creates new opportunities, not just for robotics, but for interactive art, entertainment and home applications." Yao said the researchers are refining this method, changing the printing speed or the width of the line of thermoplastic to achieve different folding or bending effects. They have also developed methods for printing touch sensors, finger sliding sensors and bending angle detectors that can control the paper actuators. In addition to Yao, Wang and Cheng, authors of the CHI research paper are Youngwook Do and Byoungkwon An, HCII research affiliates; Jianzhe Gu, a Ph.D. student in HCII; Humphrey Yang, a master's student in the CMU School of Architecture, and Ye Tao, a visiting scholar from Zhejiang University. More information is available on the project's web page, http://morphingmatter.cs.cmu.edu/paper-actuator/.